It is now 9:52 AM HAT Time on Thursday, April 25, 2019. Relay Online Registration closed at 11:59 PM on Sat, Dec 5, 2015. Date: The 3000-Yard ePostal or the 6000-Yard ePostal must be swum in its entirety on or between September 15 and November 15, 2015. Individuals may enter both events. All entries must be submitted electronically. Deadlines: Individual entries must be submitted by 11:59 P.M. HAST (Hawaii time) on November 25, 2015 (see Records). Completed split sheets for individuals who break national records must be received by the event director by November 25, 2015. All relay entries must be submitted by 11:59 P.M. HAST on December 5, 2015. Objective: To swim 3000 continuous yards or meters or 6000 continuous yards or meters in any 25-yard or 25-meter pool. If two or more swimmers report the same time, a tie will be declared. Location: Swimmers shall swim the 3000-yard ePostal or the 6000-yard ePostal in any 25-yard pool or 25-meter pool. If the event is swum in a 25-meter pool, 3000 meters or 6000 meters must be swum. If you swam in a 25-yard pool, please submit your splits and final times in yards. If you swam in a 25-meter pool, please submit your splits and final times in meters. The online entry system automatically will divide the final 25-meter times by 1.0936 and integrating them with the 25-yard final times. Eligibility: This is a USMS-sanctioned event. All participants must be registered for 2015 with USMS (or the equivalent FINA organization for foreign swimmers) on or before the day of their swim. Foreign swimmers are not eligible for USMS records or All-American status. Entries for USMS swimmers will be verified automatically. All foreign entrants must submit a copy of their equivalent organization’s 2015 registration card to the event director by email by November 25, 2015. Individual Events: Men and women compete separately in five-year age groups: 18-24, 25-29, 30-34, . . . , 100+. The swimmer’s age on the day that he or she completes his or her swim will determine his or her age group. Swimmers who change age groups during the event may enter twice but must swim the event twice, once in each age group. Fees: $10 for each individual entry ($15 for foreign swimmers) and $16 for each relay entry ($20 for foreign swimmers). Fees are non-refundable. Fees must be paid by credit card and will be processed by "ClubAssistant.com Events". Commemorative Gear: Long Sleeve T-shirt is $18 for US residents, $21 for outside US. Caps are $6 for US residents, $9 for outside US. See images at right. 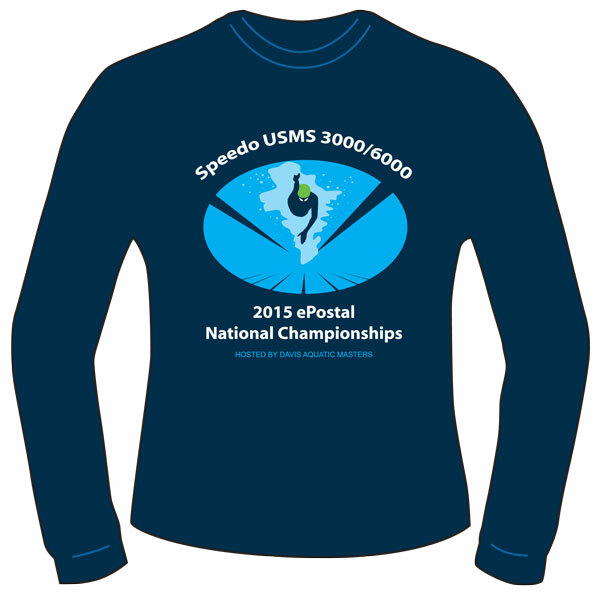 Rules: The 2015 USMS Rules govern these events, including USMS Rule 102.12.1 regarding swimwear. Drafting, flotation, and propulsive devices, including but not limited to pull buoys, fins, paddles, snorkels, and wet suits, are not permitted. No more than two swimmers may share a lane. If a lane is shared, each swimmer must stay on his or her side of the lane during the entire event (that is, no circle swimming). An adult acting as a starter, head timer, or referee shall be present at all times during the swim. Each swimmer must have a verifier to count laps and record cumulative splits every 50 yards or 50 meters. The event may be timed with either a stopwatch or an electronic timing device. One person may serve as a counter for a maximum of two swimmers per heat. A 3000 yard split in the 6000 yard ePostal event may be submitted for a record if requested in writing by the swimmer and if at least two dedicated handheld watches were used to record the split. A 3000 yard split in the 6000 yard event will not be accepted as an entry for the 3000 yard event; the events must be swum separately. No adjustment will be made for swims completed at high elevation. Records: New national age-group records will be reflected on the USMS long distance national records webpage for 2015 and will be printed in the 2016 USMS rule book. Splits: Cumulative split times must be recorded to the nearest second (final times for national records to the nearest 100th) on the official event split sheet available at www.usms.org/longdist/1hr_3000_6000_splits.pdf . Any split or final time submitted without tenths or hundredths will be defaulted to .99 second. Any split or final time submitted without tenths or hundredths will default to .99 second. Any split or final time submitted with tenths (.x) will default to .x9 second. Do not enter .00 if you did not document tenths or hundredths of a second. Entries: When you submit your results, you will be asked to enter only 300 yard or meter splits for the 3000-yard ePostal and only 600 yard or meter splits for the 6000-yard ePostal. Submission of a split sheet is not required unless the entrant has broken an individual national record. However, split sheets may be requested by the event director. If a requested split sheet is not provided, the individual entry and associated relay entries may be disqualified. Please retain a copy of your completed split sheet for one year after the entry deadline. Completed split sheets for individuals who break national records must be received by the event director by November 25, 2015. Scan and email to registrar@damfast.org. Your registration is not complete until you have received an automated confirmation of your entry via email. If you do not receive an entry confirmation email, please contact the event director. Entries by mail will not be accepted. Awards: The top six finishers in each age group in the individual event and the top three relay teams in each relay age group will have the option of receiving USMS Long Distance National Championship medals. 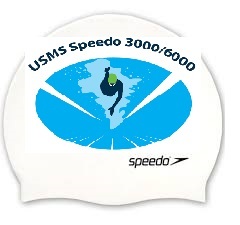 First place finishers in each individual and relay age group also will have the option of receiving a USMS Long Distance National Championship patch. Only one patch per event per participant will be awarded. Results: Complete results will be available online. Preliminary results will be posted at www.usms.org by December 7, 2015, and will be available for two weeks. All corrections must be sent to the event director during those two weeks. Final results will be posted approximately one week later. Relay Events: Relay events will be contested in three categories: 3 men, 3 women, or 4 mixed (2 men, 2 women). Each relay member must also enter the individual event and be registered with the same USMS club. Unattached swimmers may not serve as a member of a relay . Participants shall be allowed to swim in only one same-gender and one mixed-gender relay in each ePostal event. The youngest relay member’s age shall determine the relay’s age group. Age groups are 18+, 25+, 35+, . . . , 95+. The cumulative time for the individual swims will be the relay time. Relay Entries: The entry period for relays will open on November 28, 2015. Relay entries will be displayed by USMS club and will include the entrant's time. You will only be able to view your USMS club's entries. Relay entries must be submitted by 11:59 P.M. HAST on December 5, 2015. Club Event: Each club will be entered automatically in the club event. Club scores will be calculated on the basis of quality points, which are the ratios of each individual’s time to the corresponding USMS record for the gender and age group. The faster the swim, the more quality points a swimmer earns. A club’s total will be the sum of the quality points of each of its swimmers. Because every swimmer will receive quality points, every swimmer counts. Questions: Contact the event director, Erica Fleishman registrar@damfast.org. Online Registration closed on 11/25/2015.